Frank De Alba is ready to close out 2017 with a bang when he takes on Ivan Najera (17-3, 8 KOs) in the ten-round super featherwight bout Tuesday night. 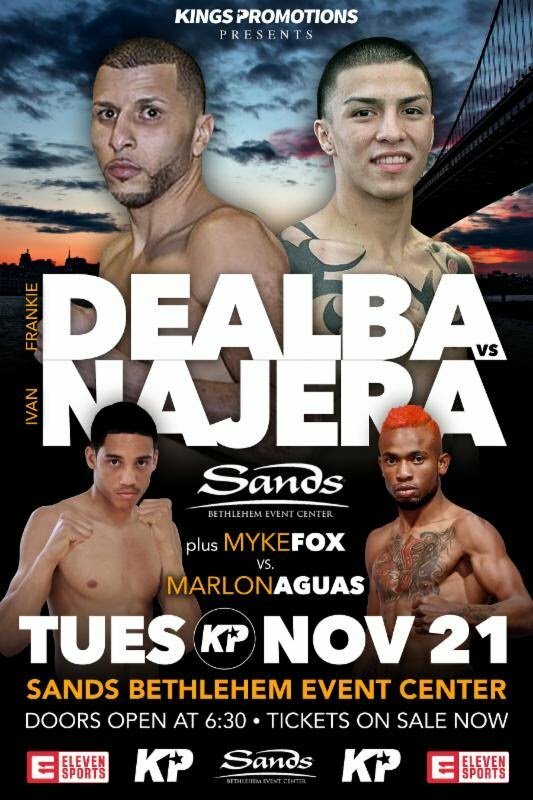 November 21st at The Sands Bethlehem Event Center in Bethlehem, PA. The 30 year-old De Alba will be looking for his 6th consecutive victory as he has had a terrific year with wins over German Meraz and Ryan Kielczewski (26-2) in 2017. “Everything is good. I put in a hard eight-week camp,” Said De Alba. De Alba and Najera were originally supposed to get together earlier this year, but Najera had to pull out. A win over Najera and a 6th straight win will De Alba should facilitate big opportunities for De Alba in 2018. In the eight-round co-feature, undefeated Mykal Fox (14-0, 4 KOs) of Forestville, MD takes on Manuel Reyes (11-3-1, 5 KOs) of Los Angeles in a junior welterweight bout. Highly-touted prospect Joseph Adorno (4-0, 4 KOs) of Allentown, PA will take on Jahaziel Vasquez (1-4) of Monterrey, Mexico in a super featherweight bout. Marcus Bates (7-0-1, 6 KOs) of Washington, DC battles Antonio Rodriguez (11-19-1, 5 KOs) of Durango, MX in a super bantamweight bout. Martino Jules (1-0) of Allentown, PA will take on Weusi Johnson (2-6) of Wilmington, Delaware in a featherweight bout.